NOTE: Base weights cannot be used as actual bases. They add weight by going on top of existing bases. No more need for unsightly cinder blocks or bulky sandbags. 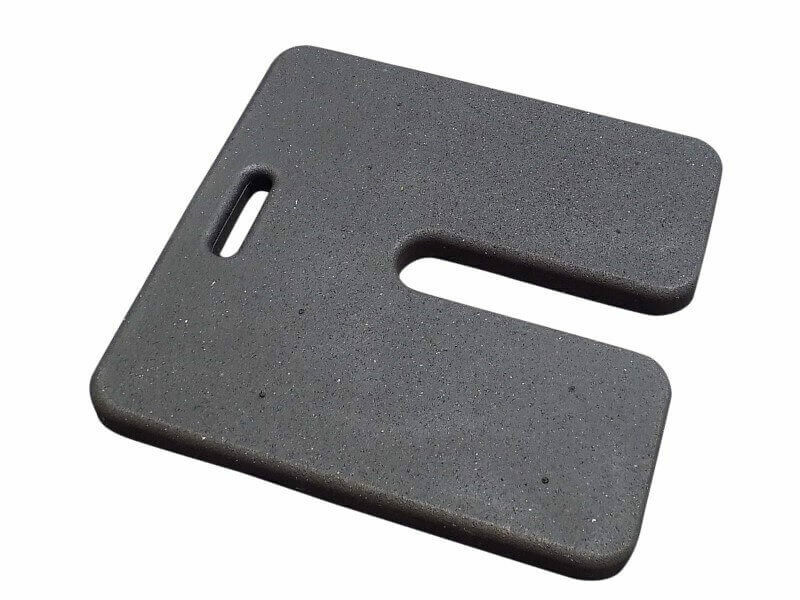 Our Rubber Base Weights look great, and are built to last. Make your bases even heavier with these 20 lb. * rubber base weights. A quick and easy way to add stability to your display. 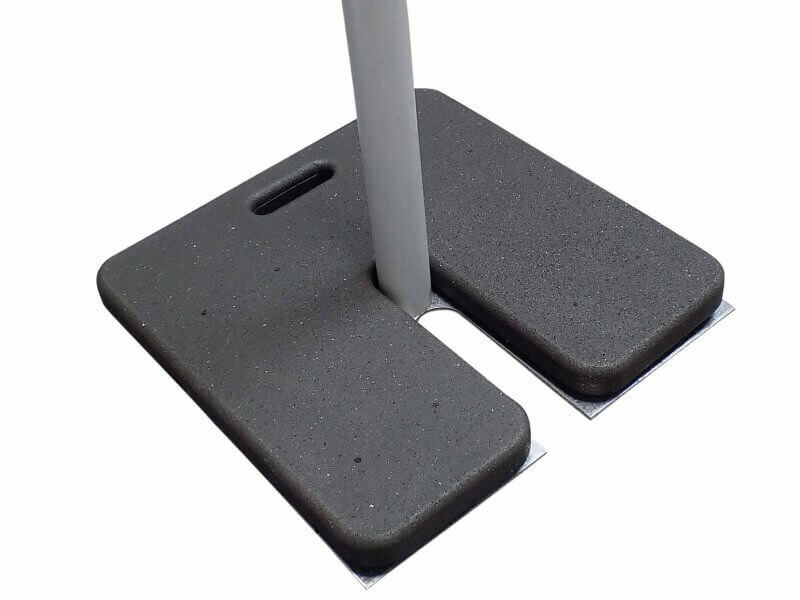 You can add multiple rubber base weights on top of each base to increase the weight as needed. Measures approximately 18"L x 18"W x 1 1/2"H. Can be used with smaller bases, though base weight will hang over. U-shaped ("horseshoe") cut out allows the weight to easily slide over your Base and against any upright pipe up to 2 inches in diameter. Handle cut out at the top makes carrying even easier. This is for the base weight only. Base sold separately. *Made of rubber and may have production variances that affect the actual weight approximately +/- 1 pound. These are a staple at every event where we are putting up drape, huppah, or even other structures. They allow us to use smaller base plates, and add extra stability when needed. great service great product! will order from you again! Great customer service and the product was perfect! Q: Do these work around the standard 2” pipe or just the smaller upright like banjo drape us used on? Q: Is this a set of 2 or do I have to order 2 in the quantity box? A: Hello, our 20 pound Rubber Base Weight is priced per unit (Quantity: 1). 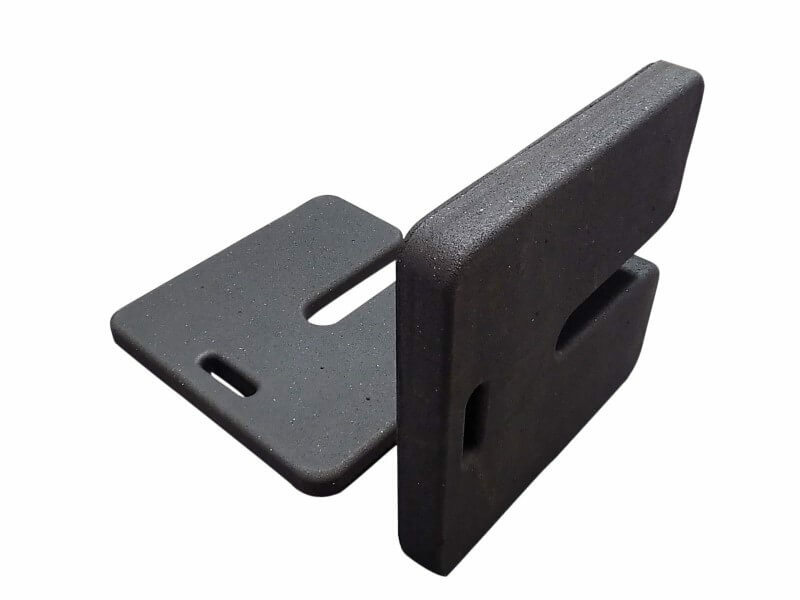 If you would like to purchase two of these base weights, you'd need to enter ''2'' in the Quantity box. Weight (Approximate, Each - subject to +/- 1 lb. variance due to nature of material): 20 lbs. 3 oz.